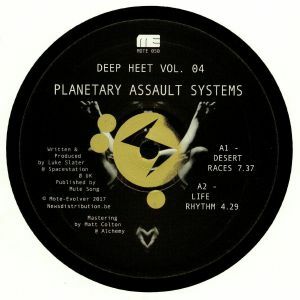 PLANETARY ASSAULT SYSTEMS Deep Heet Vol 4 vinyl at Juno Records. UK don Luke Slater returns with the fourth instalment of Deep Heet. The last edition released in 2012 on his esteemed Mote Evolver imprint is recognised by those that know as some of the most reliable techno tools in recent years: who can forget the sinister hypnotism of "Flat Tire": what a classic! You can bet there's yet more austere and ergonomic tracks for serious DJ use on offer here. Starting off with the driving and cyclical grunt of "Desert Races", then the tunnelling and trance inducing bell melody of "Life Rhythm" representing the A side. On the flip, the full throttle intergalactic charge of Random Kingdom and the dystopian minimalism of "Lazer Organical" which would make even Mike Parker stand up and notice! Slater is still without doubt one of the most singular talents in techno, respect!